UDM Downloads > Songwriter Submission Assistant Writers Edition! Most publishers have their own submission policies.With SSA you can create a separate submission template for each publisher,attach it to the publisher record in the Publisher's address book.When you submit to this publisher SSA will select this template and fill out the variables for you.This way you can always be sure you are submitting according to each publishers policies. 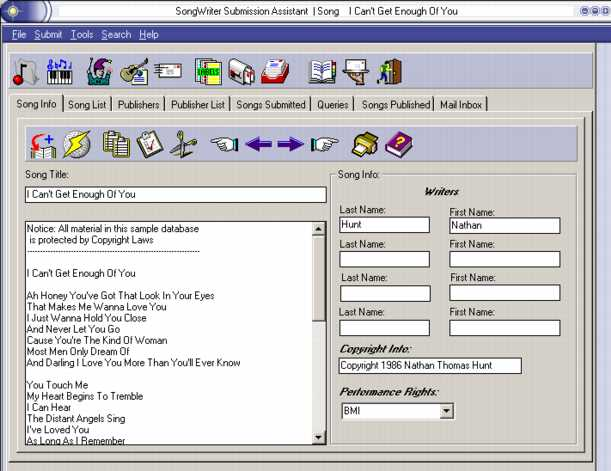 Also with SSA's unique templates you can create your own letter's and queries and use them repeatly for different publishers.When using the Submission Wizard SSA automatically fills the variables you created in your template with the correct Publisher and Song info.This saves a lot of time of repeatly typing queries and letters.